In order to satisfy the high demand of low cost and size reduction, chips, including digital and analog integrated circuits (ICs), must be integrated in the same package or printed circuit board (PCB). This leads to significant EMC issues such as the RF interference (RFI) and electromagnetic interference (EMI) problems for package and PCB designers to solve. Many electromagnetic bandgap (EBG) structure have been proposed by our group to suppress the noise coupling inside the PDN and the inevitable common-mode noise in the differential line. Another important issue for nowadays package and PCB design is that high-speed signal line (differential or single-ended) inevitably cross the slotted reference plane. Significant transmitted energy may couple to the slotline and also the PDN to result in considerable EMI, RFI and even the SSN problems. 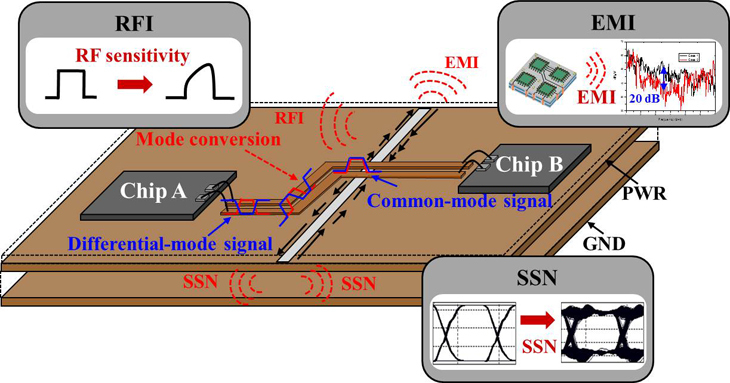 A novel ground resonator technique recently have been proposed by our group to give a low-cost and efficient solution for GHz high-speed differential line.